When a shooting begins in their school Sim and Victor hide inside a classroom and review the months leading up to the attack and the shocking revelation that through a series of events they unwittingly orchestrated the shooting themselves. For Victor it should have begun innocently enough. Boy meets girl. Boy falls for girl and a life happily ever after. But for Victor, he had to meet a girl …by running over her bike. Enter Cari Air, a rambunctious teenage girl with a penchant for costumes and imaginative interpretations of mundane phenomenon. Out of guilt he’s coerced to give her rides to school but little does she know he’s convinced they were destined to meet- due to a thinly veiled coincidence. Unfortunately his friend Sim believes otherwise. Having been burned by his own failed beliefs, Sim attempts to open Victor’s eyes by challenging his convictions with a test that will culminate in a senseless attack on their high school. In Sacco, I attempt to analyze the stigmas and stereotypes linked to school shootings. Specifically, how we force narratives on tragedies and their aftermath to create environments that feel safe- when luck and happenstance play much larger roles. Moreover, how we as humans arbitrarily thrust meaning on inconsequential occurrences and trivial objects. I was born and raised around Madison Wisconsin and graduated from Milwaukee Institute of Art and Design. I began doing freelance illustration work for companies, underground magazines and newspapers around Chicago. After being approach by several writer’s to illustrate their projects I decided to write my own story. 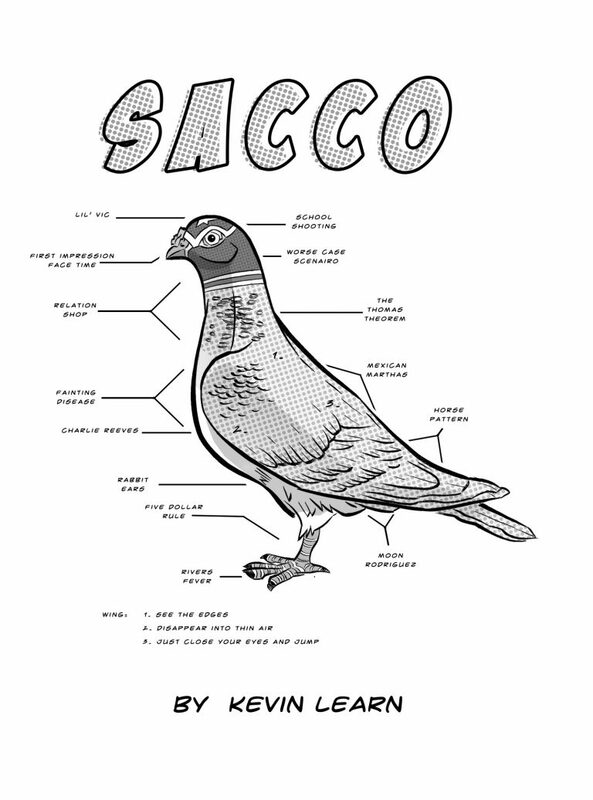 I have completed nearly 200 of an estimated 300 pages for “Sacco.” In recent months I have collaborated with other writers on smaller projects for anthologies, while still doing freelance work when I can, working on Sacco, and holding down my day job.